Votre propre maison de Woodgate Beach luxueuse, calme, romantique et privée, abordable et privée - accès à la plage en 4x4 et pêche fantastique, observation des baleines / tortues (en saison), kangourous et paradis des ornithologues. Maison dispose d'une spacieuse cuisine de luxe avec salon avec d'énormes fauteuils et canapés confortables et écran plat 42 pouces LCD TV et lecteur CD / DVD. Grand bain romantique 2 personnes. Très grande terrasse avec vue sur le lac et facile à utiliser un barbecue électrique et deux voitures de stationnement hors rue. Les kangourous paissent sur la pelouse et sont en abondance toute l'année à Woodgate. Pristine Woodgate escapade plage, entouré d'un parc national, laisser tout votre stress derrière quand vous découvrez Lakeview à Woodgate, vous serez pris dans le temps pour un séjour en maison de plage des années soixante avec tout le confort moderne. Cinq minutes à pied de Woodgate Hôtel, un grand pub local à l'ancienne avec cheminée en hiver, une excellente nourriture et de divertissement le week-end et magnifique plage immaculée et sécuritaire. Porte d'accès à la barrière de corail et la ville historique de Childers. Vous ne savez pas où vous voulez passer vos vacances à Qld, alors vérifiez nos autres propriétés de vacances Riverina Beach Villa, Noosaville Qld et Eversleigh Waters, Scarborough Qld, soumettre une demande via ce site ou voir en ligne. Ceci est un véritable paradis des observateurs d'oiseaux et à quelques minutes à pied un coffre-fort, toute l'année natation ronde plage. accès 4WD plage Grande et pêche fantastique tous à quelques minutes en voiture de Lakeview. Si vous êtes à la recherche pour des vacances reposantes et vous êtes un amoureux de la nature, je vous garantis, une fois que vous avez séjourné vous serez de retour. Si vous voulez des discothèques, des lumières de la ville et beaucoup de bruit, ce n'est pas l'endroit pour vous .. Le Hinkler Hall of Aviation est l'attraction touristique australienne la plus récente et l'aventure aventure aéronautique Qld Award 2009). Plus qu'un musée, le Hinkler Hall of Aviation rend hommage à l'aviateur solo pionnier Bert Hinkler et aux merveilles de l'innovation, de l'esprit et de l'aventure. Comprenant une salle d'exposition en plein essor, avec des expositions multimédias, un simulateur de vol, le Globe Theater, cinq avions et l'historique Hinkler House, le Hinkler Hall of Aviation, dans les environs tropicaux des jardins botaniques de Bundaberg, vous offre un aventure intéressante, où vous et votre famille deviennent une partie de l'histoire. La plage de Woodgate est située à 350 km au nord de Brisbane, dans le Queensland, en Australie. Imaginez 16 km de plage de sable blanc immaculée, aux eaux cristallines, sur un fond de 23 100 hectares du parc national de Burrum Coast. Complet avec des sentiers pédestres et une promenade avec des zones de pique-nique en bord de plage isolée. Très grand bain et douche séparés. Les toilettes sont séparées. Il y a aussi une douche extérieure chaude / froide. We had stayed in a cabin at the caravan park the week before we went to Lakeside and despite being much smaller the presentation and bedding of the cabin were first rate. So our first impression upon arriving at Lakeside was disappointing as the cleaner was obviously only doing a superficial clean. The first thing that one noticed was an unpleasant dank smell in the house - why had the cleaner not been around to open some windows ahead of the guest arrival? Earlier reviews had noted this issue. The lounge furniture is old and was covered with old throws which were tired and uninviting and ought to have been replaced. Dust and cobwebs under all furniture. So we spent several hours cleaning so we could relax and feel comfortable and enjoy our time at Lakeside. The bedding is another area we suggest be improved. Old stained mattress protectors dont encourage re-bookings. Bringing our own bed linen and pillows we coped for 3 nights but our experience could have been so much better and we hope that the owner takes the initiative and upgrades the bedding. And gets rid of the artificial flowers in the main bedroom - these were covered with dust and we spent 15 minutes cleaning them so we could sleep comfortably. Good bathroom and a bath was appreciated and plenty of hot water. BUT 1/4 of a toilet roll only was provided - cleaner needs to lift game. Pity guests arriving late at night with no shops open. Washing machine worked OK but there was no dryer and importantly no hairdryer...ladies bring your own. House only cost was modest but after pet fees, cleaning fees and booking fees were included what seemed initially to be a modest rental became a not so modest rental and was 60% higher than house only fee. Woodgate is a great beach and we hope that the owner is able to rectify the cleaning issues and take our suggestions on board re bedding upgrade and add in the little welcoming little touches like milk in the fridge and adequate toilet paper. Sorry to hear you were dissatisfied with your stay at our beach house. It is difficult getting good cleaners in Woodgate because it is a semi remote location and I live several hours away. Thank you for your feedback. I have managed to change cleaners, so hopefully the cleanliness will revert back to original std. The pricing is very reasonable and additional fees for a pet and cleaning are std practice and my charges are much lower than most houses in the area. I have no control over the booking fee as this is HomeAways commission. I don’t advertise commodities as this is not a serviced hotel but a holiday house where it is strongly suggested you bring all of your own requirements for your stay. I don’t advertise a dryer or hairdryer. I have purchased over 10 hairdryers and all have been taken by guests so I no longer supply one. I don’t have a dryer as I am trying to keep costs down, but will consider getting one. I will definitely have a full spring clean done and will update mattress covers and ensure sofa covers are cleaned. Belinda was very easy to communicate with and very welcoming. Location of the house is great, short walk to beach and pub. House had everything we needed to enjoy our stay. Though the cleanliness of the house needs some attention to detail and a thorough clean. Looking forward to our next trip to Woodgate. This home has a nice big living space on entry and three reasonable sized bedrooms. So "good bones" but no apparent effort on the part of the current owner to create a welcome on arrival. Our first act on entry was cleaning the greasy oil laden oven (I took pictures), locating and using the hoover and dusting everywhere to remove debris (more pics). This was despite paying the compulsory $90 cleaning charge up front. What exactly did that cover? It was also disappointing to find not even a drop of milk for tea in the fridge. We've been lucky enough in the past that hosts have left a small welcome pack. When you have traveled some distance and don't yet know where the shops are in town, this is much appreciated. However, don't expect one here! Instead we were welcomed (after cleaning) by a rather sad atmosphere of damp inside the property which required all the windows opening to improve (it did). There's only one single low power convection heater provided - totally inadequate given this is a three bedroom property. Our stay coincided with a cold snap so this was particularly disappointing. Furniture throughout has seen better days and the bed in the third room is best described as suitable for light use only (by a toddler). Lots of blankets are supplied which we appreciated, thanks. On the positive side, there was a good selection of books provided and all the equipment (tv, music system and kitchen appliances) worked fine. The property is in a great location and Woodgate is fabulous, everything we hoped for. However, we will definitely be looking for new digs for our next stay. Sorry you were so disappointed with our home. Please note that Woodgate is remote and our property does not advertise a welcome kit same as most properties in Woodgate. We will however take on board your feedback for later. The house was locked up before your arrival but like any home you have to open it up to air it out. We pride ourselves on not using chemical cleaners or artificial deooderisers as we have allergy issues ourselves. I have advised the cleaner to check the oven and she will be doing a spring clean to address any detailed cleaning issues. . The furniture is reflective of what we enjoy comfortable and homely. I would suggest you try one of the new high end properties now available at Woodgate next time and pay the high price associated if you prefer a newer property. Could you pls email me your photos as I did not receive them and I can forward to our cleaner. As a group of four adults and six children I was worried that we'd be on top of each other, but the house has a very generous living room with plenty of comfy couches, a large kitchen area and decent-sized front deck. The spaces under the carport and on the front lawn are great for watching the sunset. We saw a kangaroo one afternoon, much to the children's delight and there's plenty of birdlife around the lake. The location is great. 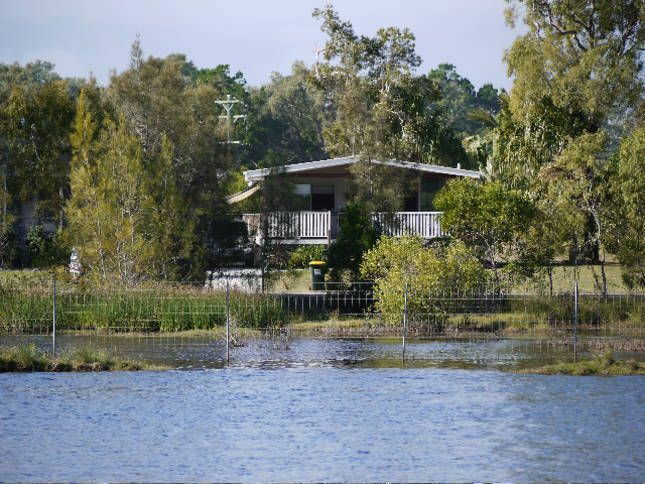 Walking distance to the beach and boat ramp, as well as the local hotel and bottle shop. The house is nicely decorated and felt homely. Huge shower and bath great for washing our tribe. The only negative is the lack of fan in the children's room, though we were able to move the pedestal fan from the living area into the kids' room. Otherwise, a very positive experience and Belinda was great to deal with. Thanks Chris, glad you enjoyed your stay. I though I’d let you know we have installed ceiling fans in the third bedroom, lounge and dining rooms. We had a very comfortable and relaxing stay in very pleasant setting. Quiet area and convenient to beach. Plenty of interesting places to visit nearby. House was clean and well equipped. Our stay in Woodgate was memorable and we plan to return again. The beach was exceptional and our experience playing bowls at the bowls club was enjoyable even for us non-retirees. Votre propre maison paisible et relaxante de 3 chambres à coucher loin de chez vous avec une belle terrasse surplombant un lac charmant avec un barbecue électrique facile à utiliser. Deux canapés confortables et deux fauteuils avec beaucoup de coussins pour se détendre avec un grand roman de notre bibliothèque de livres. Sirotez du vin à notre table de bar en plein air et regardez les oiseaux et les kangourous chercher de la nourriture. Douche extérieure chaude et froide supplémentaire. Deux voitures dans la rue. (Chambre pour garer caravane et grand bateau) Les kangourous paissent sur la pelouse et sont en abondance toute l'année à Woodgate. Il n’ya pas de crocodiles ou de stingers mortels à Woodgate et il fait chaud toute l’année. La barrière de corail et l’accès aux tortues via Bundaberg se trouvent à 35 minutes de route.